I’m pleased that one of my paintings in oil pastel, ”Cezanne’s Jug,” is included in an exhibition of drawings, paintings, and pottery vessels now at the Dundas Valley School of Art (DVSA) Gallery. Each of the artists represented has contributed one piece to “At The Table, ” a satisfying and varied exhibition, that explores the Still Life and its subjects. The participants are: Scott Barnim, Rae Bates, Helen Beswick, Wayne Cardinalli, Barry Coombs, Christie Gruppe, Rae Hendershot, Monica Hess, Jody Joseph, Louise McCann, Katherine MacDonald, T.R, MacDonald, John Miecznikowski, Terry Osborne, Colleen O’Reilly, Marla Panko, Janet Parker, Patricia Peacock-Evans, Timothy Smith, Anne Sneath, Holly Sneath, Rosemary Van Bruggen, Ann Walsh and me! I’m proud to be included with this group of artists. The gallery is located in DVSA at 21 Ogilvie Street in Dundas Ontario, and the show continues until June 12. 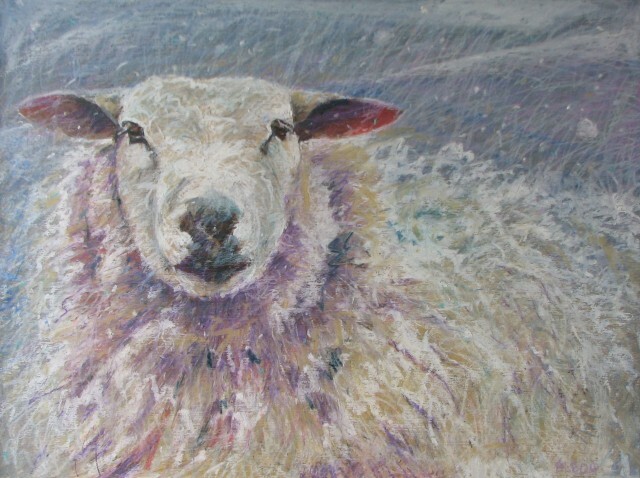 Some of my sheep paintings have moved into the Art Etc. Shop at the Art Gallery of Burlington, as part of the 2015 collection of works available to buy or rent. I’m very grateful for the enthusiastic support and promotion I’ve received over the last few years from Rhonda Bullock, Sales and Rental Coordinator and Nancy Helmers, Shop Manager. 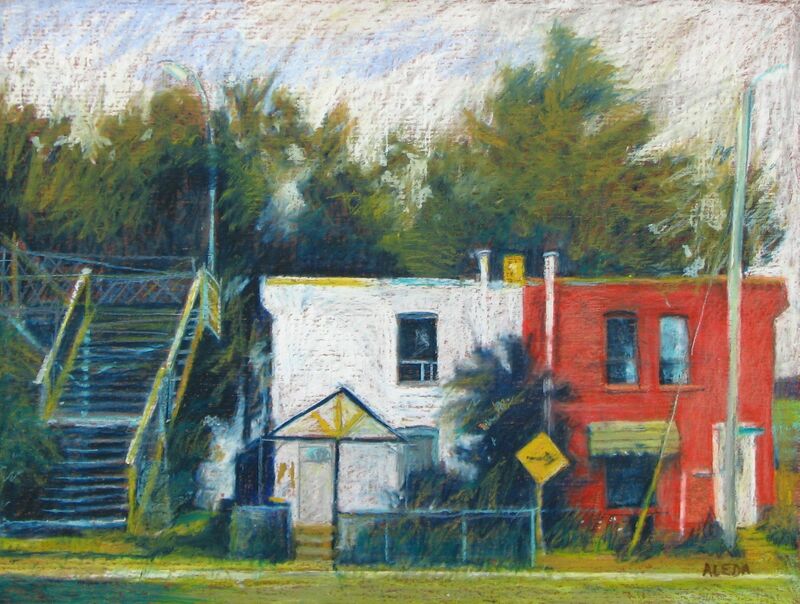 As a result of their efforts, many of my paintings have made regular appearances on sets for such programs as Rookie Blue a Canadian police drama television series starring Missy Peregrym and Gregory Smith and Saving Hope a Canadian television medical drama starring Erica Durance and Michael Shanks. I’m chuffed. #Hamilton2Views a two-person show with Barry Coombs, continues until November 14, at Earls Court Gallery, 215 Ottawa Street North, Hamilton. The gallery is open Tuesday to Saturday. After focusing mostly on rural and maritime landscape for more than a decade, the shapes and colours of Hamilton’s cityscape are a change of direction for me. 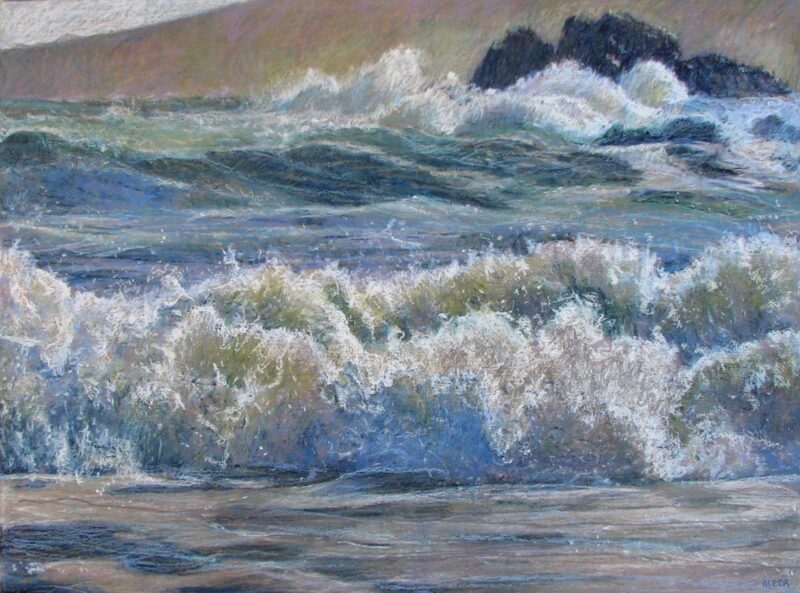 These paintings are all Oil Pastels on panel. 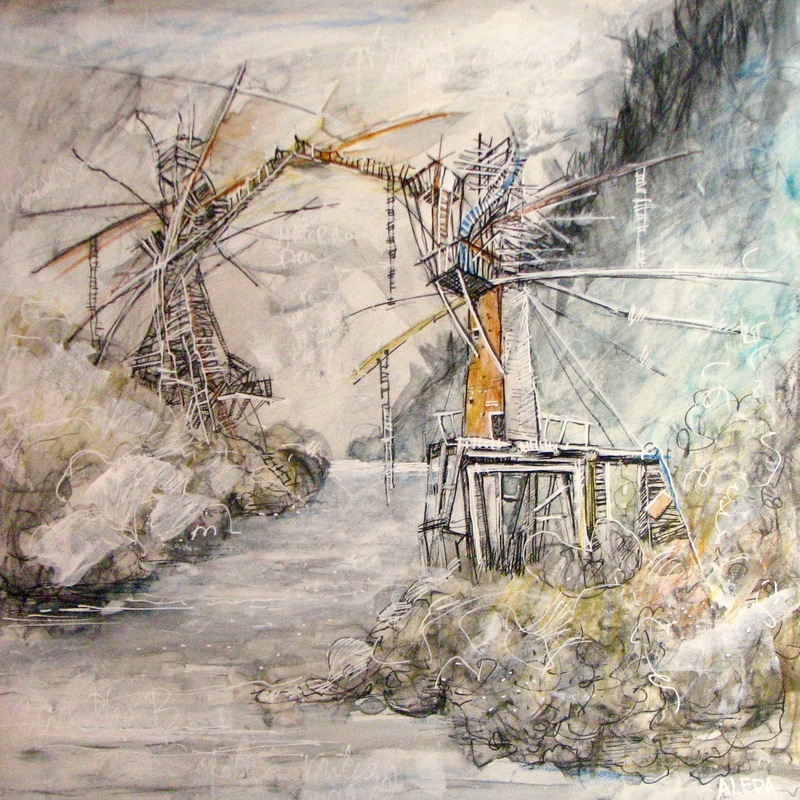 My approach is similar to drawing, using every imaginable mark-making technique, from layering and cross hatching, to blending and scratching with tools, my fingers and paint mediums. Since we moved to Hamilton in May 2012 I have been documenting the city and its inventory of wonderful residential, commercial and industrial locations. But it wasn’t until Barry Coombs began documenting the urban landscape in the city that I fully embraced this project. The idea of a conversation between two artists’ vision of the same subject, sometimes the very same places, added particular piquance to the idea. All of my work in #Hamilton2Views is done in Oil Pastel on wood panel. 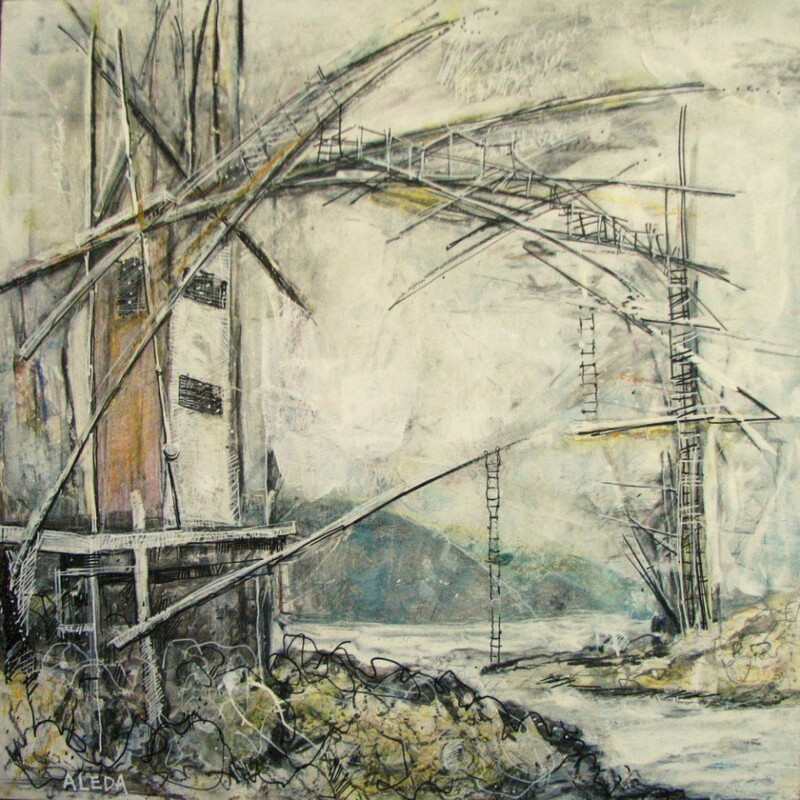 My approach is similar to drawing, using every imaginable mark-making technique, from layering and cross hatching, to blending and scratching with tools, my fingers and paint mediums. I was introduced to the New York Ash Can school of painters when I was still in art school, and always admired Edward Hopper. 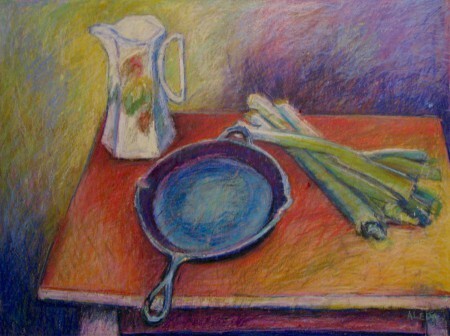 I didn’t discover the wonderful pastels by Wolf Kahn until I had begun using pastels myself. His landscapes and use of colour made a permanent impression. For many years I have also referenced the compositions, structure and brushwork in paintings by Henri Matisse and Richard Diebenkorn. I’m looking forward to seeing my work hanging at Earls Court Gallery in Hamilton Ontario, as part of a two-person show with my partner Barry Coombs. We’ve both been painting Hamilton’s urban landscape for quite a while for this show, but because our two approaches are completely different, the outcomes have been fascinating! Everyone is invited to the opening on October 9, from 7:00 to 9:30, at the Earls Court Gallery, 215 Ottawa Street North, Hamilton. The gallery is open Tuesday to Saturday. My exhibition of new work, Flock, ended this week. I’m very grateful for all the support and encouragement I’ve received and for the effort that people made to attend. I’ve had many questions about why I chose them as the subject for a show. They seemed a natural for me. My affection for them is deeply embedded. I was introduced to sheep through nursery rhymes, songs and bedtime stories. They have been associated with people for more than 10,000 years, since they were first domesticated and have been depicted throughout history in paintings, drawings and sculpture. 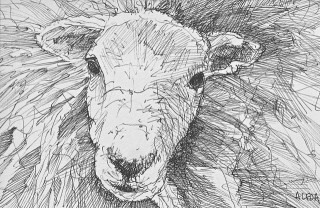 The most memorable for me are Henry Moore’s charming line drawings of the sheep outside his studio at Much Hadham, in East Hertforshire. I’m not sure if their similarity to clouds inspired me to consider painting them instead of my usual landscapes. It’s likely, because in my search for places that are shaped by weather, I have often found them patiently munching while enduring extreme climatic conditions. If they aren’t sheltering from snow, rain, fog and wind, they are huddled into shady spots to escape the burning sun or searching parched riverbeds for water. I made my first painting of sheep more than 20 years ago and have returned to the subject many times. This collection was completed between November 2012 and March 2014 in my Hamilton studio. I painted the first few to accustom myself to a new work space after moving to the city in 2012. 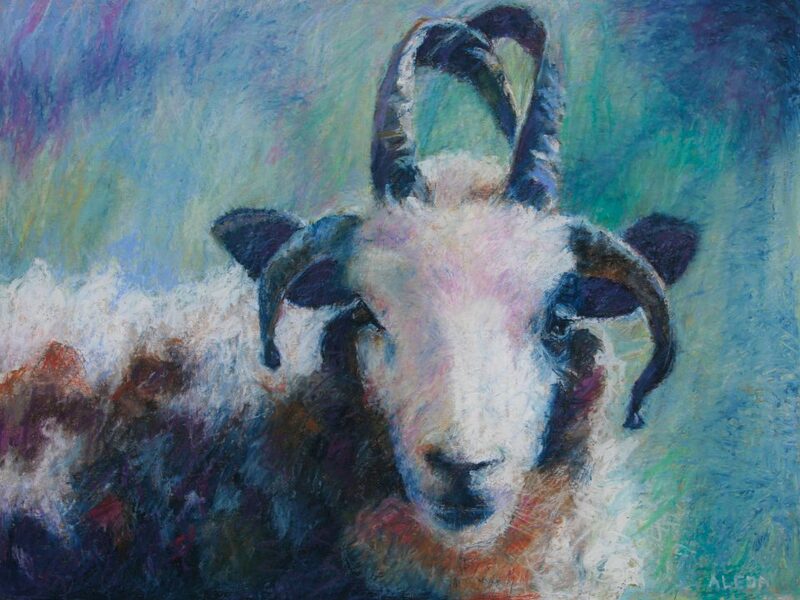 Their texture and forms are so well suited to interpretation in oil pastel that I just carried on until I was surrounded by my own gentle flock. I’m very excited about my solo exhibition of new work, FLOCK, at the Gallery in the Dundas Valley School of Art (DVSA), 21 Ogilvie Street, Dundas Ontario. The exhibition will be installed on May 3 and runs until May 24. The Opening Reception is on Saturday May 10, from 1 p.m. to 3 p.m. Please join me! The Gallery is open from 9 a.m. until 9:30 p.m. Monday to Thursday, and from 9 a.m. to 4 p.m. on Friday and Saturday. It is not open on Sunday. Phone 905-628-6357. DVSA is an independent, not-for-profit art school that has made an enormous contribution to the visual arts in the Hamilton area for more than 40 years. The Art Etc. Gallery in the Burlington Art Centre, has added six of my new Oil Pastel landscape paintings to their collection of works for sale or rent. Located at right on Lake Ontario, at 1333 Lakeshore Road in Burlington, ON, the shop features original works by established and emerging artists.